Processing an Image; High Contrast. There are philosophical issues for many people when it comes to image processing. Some are purists (read that with a light seasoning of scorn 🙂 ) who believe that the camera is an infallible recorder of the truth. Well I’ve had my say on that and don’t propose to get into it again (at least until I am sufficiently irritated). Needless to say I am not a purist save where what I want the image to say is concerned. I am a big fan of the old, decaying and/or dilapidated. New and perfect is fine and can make great photographs, but it is in the old and used that character lies. Visually, the textures and shapes of old, used object is what catches my eye. Unfortunately I rarely get a chance to photograph them in the optimal lighting conditions to emphasize the texture. In addition, I like strong textures. 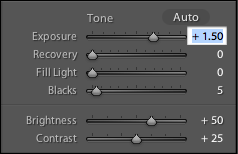 My primary image processing software of choice is Adobe Lightroom. This is not the place (or time) for a basic user tutorial of Lightroom, so I am going to assume that you can follow along. All the steps used in this process are under the “Develop” module. I did not delve into any of the deeper capabilities of Lightroom such as the Local Adjustments (brush or graduated filters) or tone curve. Now just to be clear, this is my way of doing things. It is not the only way and it is not the “right” way. You may like it, or you may not. But it is the way I like it. 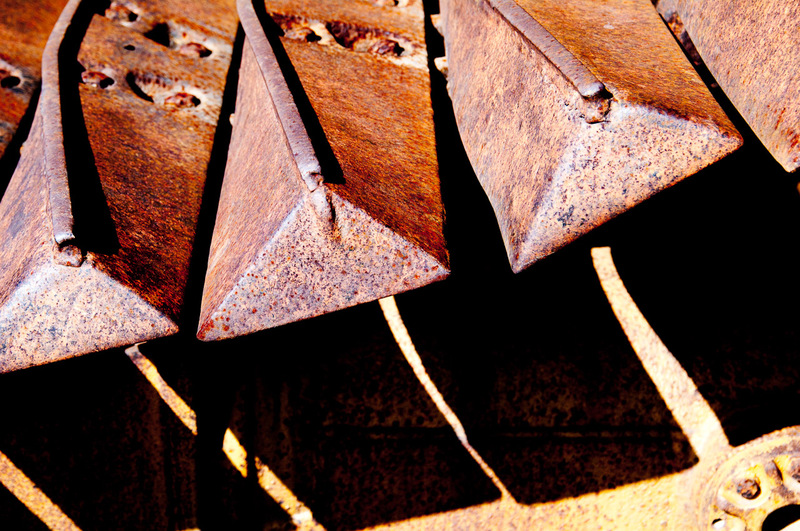 As you can see the image to the above, what I’ve got is a strong composition of shapes and textures. As soon as I saw the bulldozer at the side of the road I knew I had to get a shot. It was rusted and clearly well used and was parked in the open in the eye searing midday sun. When I got out of the car I had to squint and my eyes watered when looking at the bulldozer. The camera captured a perfect exposure . . . from its perspective. I am guessing if my eyes worked like my camera this is how I would see things, but they don’t and I didn’t. The first thing I did was to bump the exposure up an absurd amount, +1.5ev. Anyone with some experience processing photos will tell you, amateurs push the sliders up to a million, pros you can tell by their subtlety. Ah well, colour me an amateur :). As you can see, even the histogram was shocked. A bit washed out, but none of it is blown out yet. There is a remarkable amount of flexibility in the Pentax K7 files. Anyway, moving right along. We are getting a little closer to where I want to be with regard to the intensity of the light, but I’ve lost the grittiness of the texture. My next step is to boost the black levels. Working firmly in line with the fundamental principle that more is more I set the black level to 75. Nothing here is looking any good at all. It must be clear to everyone that this image is completely and irretrievably spoiled. Well to sort out some of that oversaturation issue, my next step was to drop the saturation. 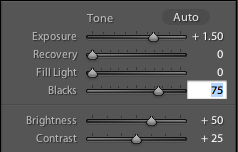 There are two controls for saturation in the Develop module; vibrance and saturation. Saturation works as a sort of global adjustment. It increases and decreases saturation across the board. Vibrance, on the other hand, is a bit more selective. It increases the saturation of colours that are not as saturated. I tend to use them both in varying ways. In this particular photo I found that I liked the saturation at -75 and vibrance at +35. So the image starts to approach where I want it to be, but not quite. It has the texture and brightness that I want, but not that post apocalyptic glaring look that has become the standard (ironically) in post apocalyptic movies :). There is still something lacking to me, it just isn’t where I want it to be as yet. But the glaring “problems” with previous processing steps have mostly been sorted to my satisfaction. The next step is Clarity. A very appropriately named control, used judiciously it sometimes feels like removing a film of gauze from in front the image. Most of the time I rarely exceed +40. With this image (of course) a bit more is needed. +75 here we come. The midtones (what little of them are left after reaching this very high contrast point) are now a bit sharper. It seems strange to describe anything about this image as subtle, particularly an adjustment of +75 clarity, but the difference isn’t huge. I’m still not happy but by this stage I’ve figured out how to get what I want, so a bit of tweaking to the brightness and contrast, +15 and +80 respectively and almost everything is as I want. Now, finally, by making a great intuitive leap (20 minutes of trial and error) I realize that the colour temperature is too cool and doesn’t match the feeling of the midday sun in Guyana (at least the way I see it). So a couple more quick tweaks. I don’t usually process my photos as dramatically as this, but for a very long time I was taking photos of old machinery and was completely unsatisfied with how they looked. They looked nothing like I imagined when I looked at the scene. The reason I could never get it right is because I didn’t have the knowledge about images that would permit me to know what I had to do to get it right. Through a significant period of trial and error I eventually came to this, which I am pleased with as it finally represents what I want to see. The conclusion for me is that you either have to know precisely how images work; contrast, levels, white balancing, etc. Or you have to do as I did, work until it is what you want it to be. If you’re interested, I created a lightroom preset for this bit of processing and all you have to do is download it here, import it into Lightroom, apply it, season to taste and its done. The final image is much better than what you started with as far as interest and clarity. Even without your description it has that feel of hot baking sun that the original doesn’t. Nice one !! I never altered the exposure so far in lightroom.. Pushing the exposure that far was the leap that took me a long while to make. Prior to that I was trying to achieve this look using all sorts of different methods, unsuccessfully. Then I just pushed the exposure out of frustration and, voila, I had it :). Will try your LR preset one of these days. Sasi, this one took so much effort. Not so much the writing, but the preparation of the screenshots. I had to write and do the screenshots as I was writing, quite tedious. I’ll do another soon though. I want to try and get 4 posts for June.